Margaret writes about her and Helen’s recent visit to Jessie, updates Jessie on family news, and mentions that Woodrow Wilson has been reading lots of detective stories. I'm a pill not to have written you some of the happy thoughts I have been having about my little visit with you. I was happier during those two days with you than I have been since July. They were a veritable God-send to me. You can't know how much deep joy you gave me, you precious one. Helen and I have been raving about you and your little house, and I think that our ravings would match even Cousin Lucy's enthusiasm over those she loves best. We can't decide which of us enjoyed our visit the most, so just to ensure a truce we agree that our enjoyment was equal; but between you and me nobody could have enjoyed you and your friends as much as I did.Helen told you, I guess, of our little trip to New York. Nell and Mac are going South. I don't know exactly where, on Saturday to stay two weeks. They are well, but they both need a rest badly, and I am oh so glad they are at last going to get it. Father is perfectly well. He is reading piles of detective stories. I wish so that I were an amusing person, for I feel so helpless about helping the time pass for him! I don't know any political news to tell you except what is in the papersMr Bryan is going away for a rest soon and I hope that the absence of Father's “oldest son” as he calls him will relieve Father a bit.Helen went to Nell's to dinner last night to help entertain two Englishmen and she says that Nell is a wonderful hostess. She certainly is.Jetty darling I adore you and Helen and I both think that you are being too wonderful for words. You make it a pleasure, sheer delight, to be with you and you must know that you are unlike your kind on being so normal at this time. Well you are always unlike your kind, because you are great. Thank you, precious, for your sweet kindness to me while I was in your lovely little home. Your goodness to me was just beautiful. I love you so much. Give my most admiring regard to that adorable Mrs Carter and remember to all the other friends. Please thank Mrs Carter and the Garfields again for their generous courtesies to me. Jetty will you write soon and tell me about the results of Frank's negotiations, for I am wild to know them of course. Please give my devoted love to your “Faithful Johnie” and your own wonderful self. 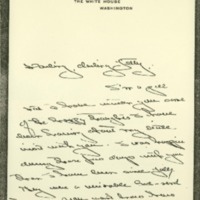 Wilson, Margaret Woodrow, 1886-1944, “Margaret Woodrow Wilson to Jessie Woodrow Wilson Sayre,” 1914 November 19, WWP17507, Jessie Wilson Sayre Correspondence, Woodrow Wilson Presidential Library & Museum, Staunton, Virginia.